The DTX400K comes equipped with 10 professional drum kits made with world-famous sounds from throughout the history of drums including Yamaha’s legendary acoustic series. By utilizing voices from our professional DTX900/700/500 and DTX-MULTI 12, each kit has extremely high sound quality with "Accent Articulation" for dynamic instruments that change sound characteristics according to your hit strength. But that’s not all - you can freely mix any of the 169 organic drum sounds to create customized kits that suit your style - even if your style is always changing. Try a heavy metal double bass kit one day then change into a dance kit the next, or keep your ten favorite kits of all time. You get a world of choices inside: 23 snares, 21 kicks, 36 toms, 31 cymbals, and 42 percussion instruments. Getting a DTX400K is really like having ten professional drum sets in one compact electronic drum kit. The tribe is calling - hear the sounds of the DTX400K right now at the "Kits" tab. It takes skills to survive in the tribe. 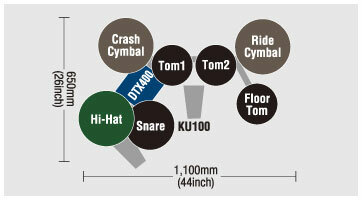 The training functions of the DTX400K have been expanded for drummers and enthusiasts of all levels. There are 10 onboard routines including warm ups, groove tools, and drumming games designed with Yamaha’s experience in Music Education to make practice fun and effective. For more information please see the "Training Functions" tab. All of these features from a leading drum company are there to help you become a great drummer. As you carve your path into the drummer tribe you can feel confident that your DTX kit can be upgraded and expanded to match your ambition. Upgrade to a 3-zone snare pad that allows you to play open and closed rim-shots with the TP70S or a 3-zone XP80 DTX-PAD*1. With the USB-MIDI jack you can connect the DTX400 to your computer to control VSTi drum sounds and enjoy recording into DAW software such as Cubase*2. You can also import new songs and beats to use in the training functions with the Musicsoft Downloader*3. *1 Requires TPCL500 ball joint mount and clamp, or set of RCL500 and CL940B sold separately. *2 Cubase and VSTi software not included. More possibility with a computer!